Since 2005, Aireworth Vets have offered a popular Zone Visit system to carry out routine equine work at a reduced cost to our clients. These have been very popular, and we are committed to continuing to provide the great value of service; we can only do this if they are as efficient as possible. Zone visits must be pre-booked at least the day before but we advise you book well in advance to ensure availability; they are run on a first come first served basis. To make the system work we need to be flexible about the vet attending and time of day. Zone visits are for routine work only i.e. first consultations, vaccinations, identity documents and micro-chipping, mite injections, blood samples, repeat prescription checks, sedate for clipping, pre-castration checks. 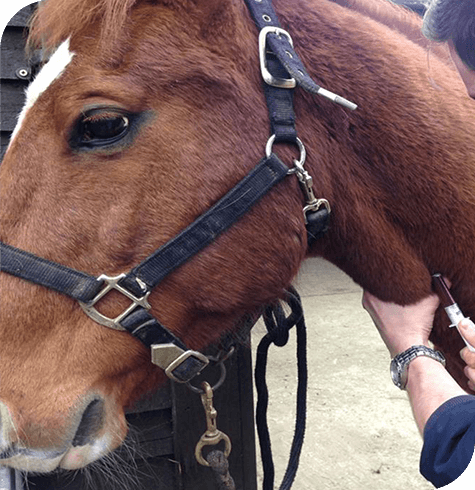 Zone visits are not appropriate for re-examinations of issues we have previously seen the horse for, dental treatment, castrations, pre-purchase examinations and reproduction. A normal veterinary visit are available for these. It is important to contact the office between 8.30-8.45am on the morning of your visits to be given your two-hour allocated time slot; failure to confirm your time will result in your zone visit being cancelled. You or a responsible person must be available throughout the 2 hours to be with your horse and answer any questions the vet may have. If nobody is available when the vet arrives, your visit will be cancelled and a fee of £15 incurred. We require all zone visits to be paid for at the time of the visit which can be cash, card or online banking transfer whilst the vet is present. At Aireworth Vets we offer dental visits whereby routine dental treatments (consultations, wolf teeth removal, routine floats) can be carried out. If 3 or more horses at the same yard at booked on for a dental visit, the visit fee will not be charged. See our dental page for more details.